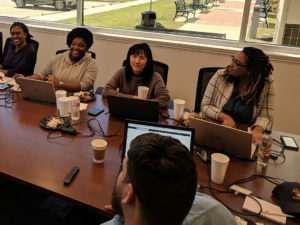 Forty undergraduate students, including 34 women, attended the Louisiana Tech University Computer Science program’s “Cyber Research for Empowering Women Experimenters” (CREWE) workshop over quarter break. The workshop provided undergraduate students from throughout the region with the opportunity to network while performing cyber experiments. It was open to all undergraduates enrolled in computer science, cyber engineering, computer information systems, and related disciplines. Attendees watched presentations by mentors from Louisiana Tech, Bossier Parish Community College, Grambling State University, Northwestern State University and the University of Louisiana – Monroe. Students had the opportunity to learn about getting admitted to graduate programs, finding a research advisor, and earning research fellowships, as well as hearing from mentors on computing topics like smart cities, machine learning, ethics in information systems, cyber security, cloud computing, and risk analysis. They then worked in teams with the mentors to develop their own research plans. The workshop culminated in each of the teams presenting their research plans to the larger group. Mentors also left the workshop with a better understanding of the roles of women in computing fields. The CREWE workshop was a collaboration across the region and was developed by Drozdenko, an assistant professor of cyber engineering, and Dr. Pradeep Chowriappa, assistant professor of computer science. It was funded by 1 of only 15 Google exploreCSR: Google Grant for Undergrad CS Research Focused Workshops for Women grants awarded across the nation. You can view a short video showing workshop activities on Drozdenko’s website.